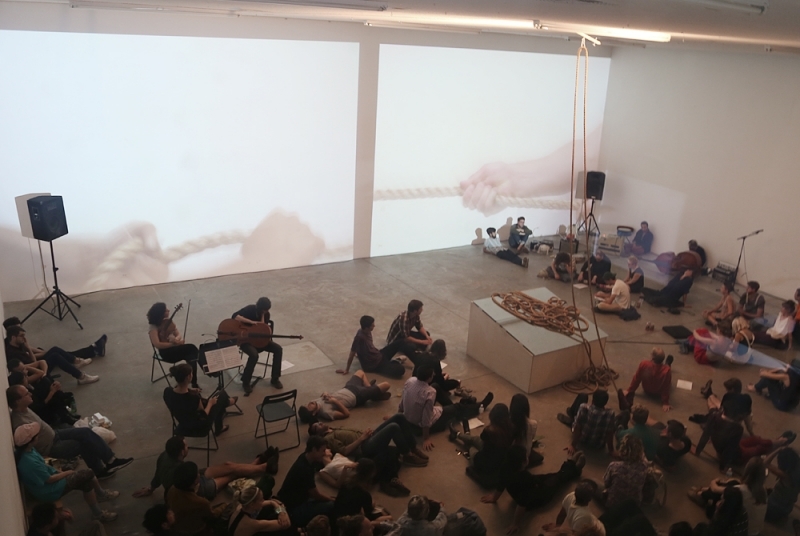 FAULT LINES is a sculptural installation, compilation record-release, and performance event curated by the artist-collective PSSST at Human Resources on Sunday Sept 29th, 2013. Molly Allis / Jenica Anderson, Bridget Batch, Alex Black, Morgan Gerstmar, Jules Gimbrone, Sarah Faith Gottesdiener / Oscar Santos, Jen Hutton, Todd Lerew, Odeya Nini, David Paha, Aidan Reynolds, Marcus Rubio, and Max Wanderman and Barnett Cohen. This project started as a desire to cultivate a space where sound becomes a physical presence. By locating artists inside a geological feature of the earth, FAULT LINES encouraged composers to create time-based work that resembles the extreme temporal scales of tectonic plates. Whether these plates appear deeply still or silent, at any moment they can send waves of massive movement and disruption. This buildup of potential energy or stress within a fault line is stored until the strain is released, causing rupture. This latent energy is analogous to the medium of recorded sound, specifically the vinyl LP that holds kinetic energy in its rotation. Although each composer worked independently from Jen Hutton’s text, the pieces are connected by their experimentation in timbre, a textural feature that helps to objectify sounds, and gives differentiation regardless of pitch or loudness. A focus on the physicality of sound textures, and the spaces that these sounds inhabit, appear to dictate the artists’ compositional choices. Often sound is considered an abstract, liminal, and/or transitory medium given meaning through its narrative thrust — where it takes the listener through a linear, time-based journey. FAULT LINES, however, is an attempt to give sound a physical body, a body where time bends, is held, expands, and is again made solid.